(Nanowerk News) Lawrence Livermore National Laboratory researchers have developed a new and more efficient approach to a challenging problem in additive manufacturing -- using selective laser melting, namely, the selection of appropriate process parameters that result in parts with desired properties. 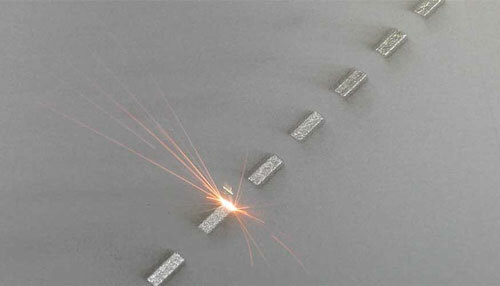 Direct metal laser melting (DMLM) machine in action: A laser fuses metal powder to form one of many successive layers that will form the final manufactured part. LLNL researchers have developed an efficient approach, based on simple simulations and experiments, to identify optimal parameters to print 3D high-density metal parts. Their work, titled "Density of additively-manufactured, 316L SS parts using laser powder-bed fusion at powers up to 400W" was recently published in the International Journal of Advanced Manufacturing Technology ("Density of additively-manufactured, 316L SS parts using laser powder-bed fusion at powers up to 400 W"). 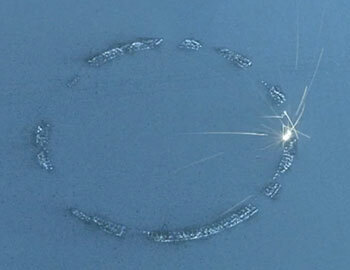 A cylinder is built using Selective Laser Melting (SLM) -- an additive manufacturing process -- and the island scanning pattern, where the region to be melted is divided into smaller islands that are scanned randomly by the laser. The LLNL team found that the use of different powders affected densities at lower power, but not at higher power. "Furthermore, for 316L stainless steel, at higher powers, the density is high over a wider range of scan speeds, unlike at lower powers," the article states. "This would indicate that higher powers could provide greater flexibility in choosing process parameters that optimize various properties of a manufactured part." Although 316L stainless steel was used in this experiment, Kamath said the team's approach can be applied to other metal powders as well. LLNL's findings will eventually be used to help certify properties of metal parts built using SLM. The paper is the first step in understanding how we can exploit computer simulations and a small number of carefully chosen experiments to efficiently determine the process parameters, Kamath said.